It doesn't do even 1/10th of what STATA can do, but it does everything for which I have used STATA in one semester of statistics and one semester of econometrics -- including graphs. What does At-ats look like? For me, it seems to work fine. 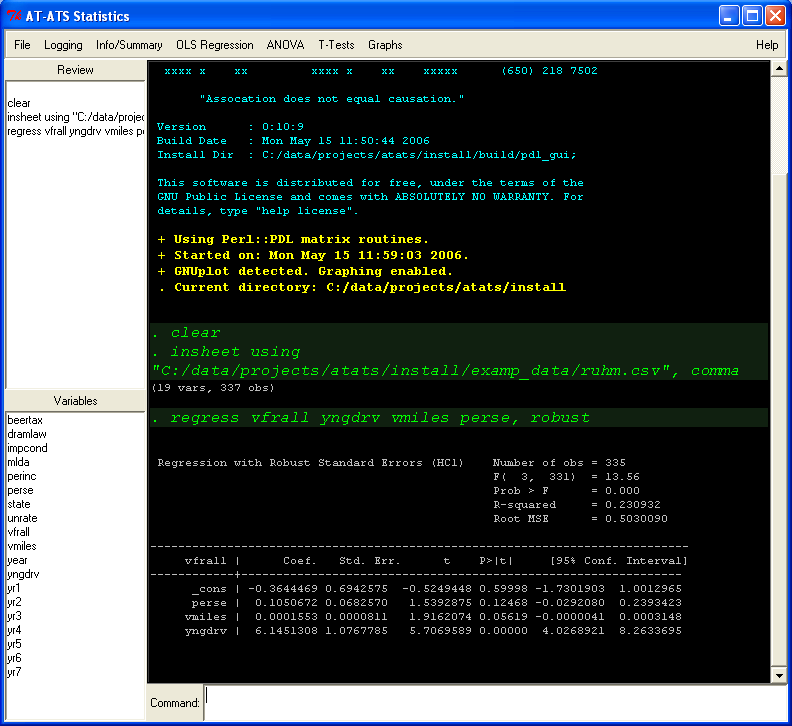 Because I have a copy of STATA, I have been able to compare the output between the two programs to see that it agrees. I'm sure that when people really try to use it for more varied work, they will see limitations and bugs, but so far, I have I have succesffuly run all my homework assignments through it. Here is a minimal how-to guide, but there is also substantial documentation built into the program itself under the "help" menu or through the help command. Will it run on a Mac/PC/Linux? It works — and there is a primitive auto-installer available, which makes it easy to set up. If you try to install with this installer and it doesn't work; let me know, I really want to make the install process smooth. unknown — I don't know anything about Macs, but I suspect it can be made to work on this platform. Do you want to help? It works — However, I have not created an automatic installer or "RPM" for it. Does anybody else at GSPP run Linux? There is no reason, theoretically, that it won't work on any platform that hosts Perl. However, AT-ATS relies on one particular Perl library called Perl::PDL that is difficult to build on some platforms. Okay, I'll give it a try, how can I get it? The later version has some bug fixes and other minor improvements, but I have not been able to test the installer script completely. The older version, however, I know has a working installer. BE ON A NETWORK AND ABLE TO ACCESS THE INTERNET. For copyright reasons, not all the files necessary for installation are aqctually in the download. The installer will fetch additional files from the Internet as needed during the install process. Download the file above. Save it on your PC and note where you saved it. A link for AT-ATS should appear in your start menu now. Click it, and your good to go. Rebooting your PC is not necessary. Click on the "upgrade" icon with the gear on it. That should do ya'. Upgrading only changes a few files usually. My fiancee insists I take a hiatus from this ridiculous project for the near term, and the requirements of school backed that up. Short form: not much will happen in the next few months. However, don't let that stop you from contacting me with ideas, etc. I may be able to work on this over the summer if people actually take an interest.